The ancient cultural holiday of the Dragon Boat Festival occurs on the 5th day of the 5th Chinese lunar month. For the western calendar, this fell on June 23rd this year and Friday was a holiday – a lovely long weekend. As legend has it, the festival began when a famous exiled poet named Qu Yuan, drowned himself in a river in 277 B.C. Local people did not want to see Qu’s body eaten by the fish so they started throwing food, such as Zongzi, into the river, and some fisherman began racing their boats out to save him. Chinese citizens now throw bamboo leaves filled with cooked rice into the water. Therefore the fish could eat the rice rather than their hero poet. Over the years this has turned into the custom of eating tzungtzu and rice dumplings. The tradition has continued year after year to honor Qu Yuan, and the constant beat of the drums, and paddles splashing into the water, are sounds that have marked this time of year in China for centuries. 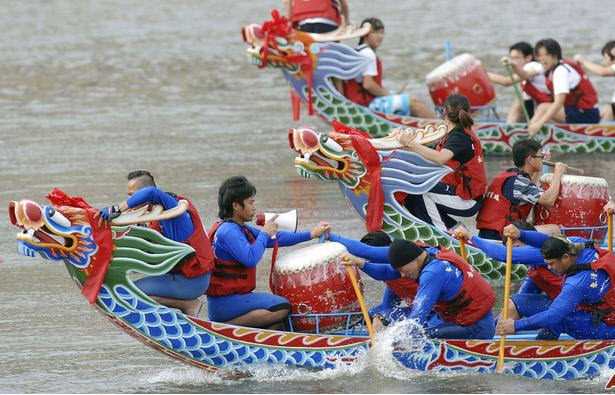 The Dragon Boat Festival is celebrated by boat races in the shape of dragons. Competing teams row their boats forward to a drumbeat racing to reach the finish end first. The celebration is a time for protection from evil and disease for the rest of the year. It is done so by different practices such as hanging healthy herbs on the front door, drinking nutritious concoctions, and displaying portraits of evil’s nemesis, Chung Kuei. If one manages to stand an egg on it’s end at exactly 12:00 noon, the following year will be a lucky one. This entry was posted in Uncategorized and tagged "This is China", Dragon Boat, Shanghai. Bookmark the permalink.